Last Friday night, I was almost possessed. I had to make a pattern for a peasant dress for Zoe. I had to prove to myself that I could do it. I can't explain it, I just had to do it. I would not go to bed until it was done. Many years ago, I was at University, studying to be a medical photographer, yes, that is what I am trained to do, but I have never worked as one, but that is a story for another day. Anyway, while at Uni, we were required to choose one subject that was not in our department. I remember at the time complaining, thinking there was nothing I wanted to do except photography related classes. Then I found a pattern making class offered by the Fashion Department. I signed up, and loved it! It was fabulous to learn how to draft patterns to make clothes that actually fitted me. I am short petite, and most items off the rack in shops do not fit me very well, or require alterations. Making my own clothes, with my own pattern, was such a revelation and a joy. So I applied my pattern making learning's, and made a pattern for a peasant dress. Not satisfied with just making the pattern that evening, I started the dress, and almost finished it. When Zoe tried it on the next day, it was a little too short, so I added the strip of fabric at the bottom. I am very happy with how it has turned out. I loved this dress so much, I made another one on Sunday, with a few small tweaks to the pattern (I made the length longer and made it less full across the chest). Zoe looks gorgeous in her new dresses. Of course, her big sister Abbey wants one now too. 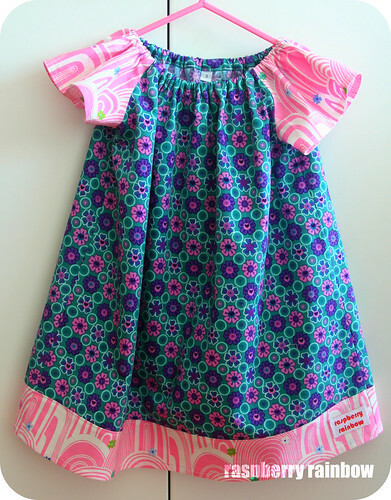 I have adjusted the pattern, and Abbey's dress will be made today with these fabrics. Right, I better get sewing. The strawberry dress is needed for a fruit themed day at kinder tomorrow. All the lovely creative spaces can be found here. Beautiful dress! 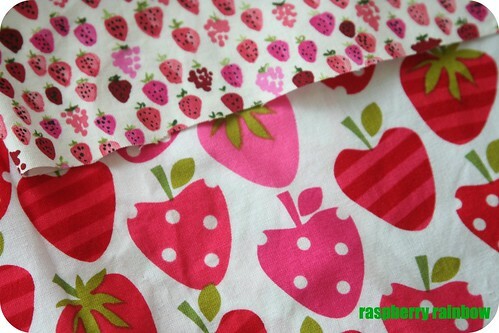 That strawberry fabric is one of my faves. How ridiculously clever are you? The dress looks so lovely (I actually like it with the strip on the bottom, it's looks intentional!) and your fabric pairings are wonderful as always! ps. I kind of understand that 'must do' feeling too. It's sometimes nice when life doesn't get in the way of it too much, and you can put it to good use! They look great - looking forward to seeing the strawberry one - what a cute idea for a fruit day. Beautiful! 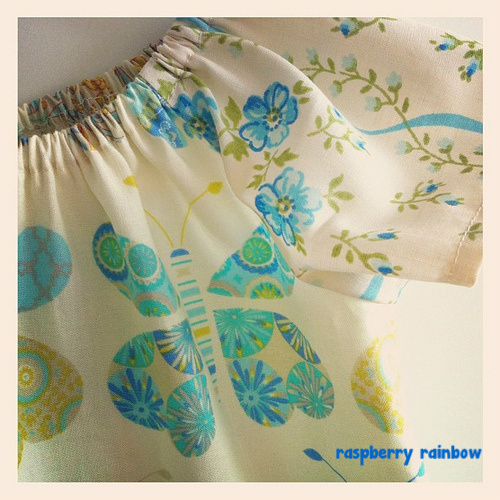 Love that blue butterfly fabric! Well done on making your own pattern. I have been on the search for a good (simple) peasant dress pattern - cant believe you can just make it up yourself! 6 years ago today, it was a Tuesday.